You can hire the whole barge and bring a group of up to 12 passengers, and choose to be catered for, with food and a cook provided, or opt for self-catering (where you supply the food and cook for yourselves and the crew). We can arrange a day sail or a weekend or if you hire the barge for anything between two days and a week then you can cruise from the starting point of your choice to as many destinations as weather and tides permit. Alternatively we also organise trips that individuals, couples and smaller family groups can join. See our sailing programme here. We are happy to take people for a day sail. From often it’s a case of charterers joining the ship the night before and setting off in the night so that we return on an afternoon or early evening tide. We also do day sails from Pin Mill (Suffolk), Chatham (Kent), Ramsgate (Kent) and from some of the piers in London. 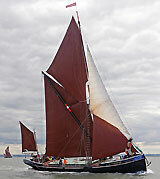 Joining us for one of the seven annual barge matches (races) is also possible on a day sail basis. These are a great occasion for sailing enthusiasts, artists and photographers. Charterers usually come aboard on Friday evening, spend two nights and two days on the barge and go home on Sunday after tea. 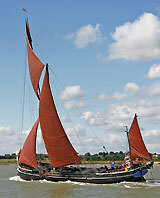 Again we can sail from Maldon, Pin Mill (Suffolk), Chatham (Kent), and London. There is no set format to a weekend. Typically on a weekend from Maldon we will go to the River Colne for the evening. Sometimes you can go ashore to visit the East Mersea Country Park and take a stroll to the village pub, or there's the option of a longer boat ride to the historic port of Brightlingsea. Alternatively you can just enjoy a quiet evening at anchor watching the sun go down on deck after a meal, followed by another sail on Sunday. The riverside villages of Wivenhoe and Rowhedge are another overnight option with the right tides. Bradwell, West Mersea or Goldhanger are other possible ports of call. From Chatham or Ramsgate we can sail round to Whitstable or the secluded anchorage in the East Swale - a fantastic and beautiful place to sail. In the Thames the industrial landscape is entirely different, but if you have never approached our capital city by water, you can follow the wakes of so many great sailors to what was once the greatest port in the World. Five day charters Monday to Friday are popular. But a four day option including a weekend, or in the week, is also a good choice, and means we have a good chance of sailing further afield up into the Suffolk rivers to Aldeburgh or Snape or even to the Victorian resort of Southwold. The Thames Estuary combines the best of town and country, wild and open spaces, beaches, waterside hamlets, idyllic nature reserves and beautiful countryside, as well as the busy and industrial upper Thames, and the biggest container port in Europe at Felixstowe. Art and photography cruises - join other with similar interests assisted by a professional tutor and learn to picture what you experience in a unique setting. Themed cruises - sail on the barge and spend time ashore visiting museums and the theatre while being looked after in five star style. Bird watching and nature trips - visit sanctuaries and nature parks. See basking seals, and experience the countryside explore the creeks in our little barge boat. A sailing charter aboard Wyvenhoe is a safe, exciting and enjoyable experience for everyone. Please download the 2013 brochure for charter prices. There's more information here about what to bring on a charter.